The Artworks Gallery was established twenty years ago as a marketplace for American Contemporary and Classic Modern Fine Art Prints. We offer works for sale by leading artists of the late nineteenth and twentieth century such as Chuck Close, Wayne Thiebaud, Andy Warhol, Michael Kalish, Donald Sultan, Picasso, Chagall and many others. 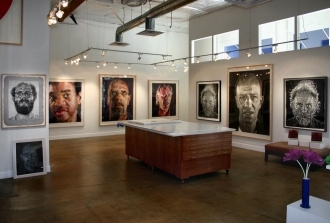 Artworks Gallery�s customers range from individuals and investors to top name Hollywood celebrities. Our mission as a fine art dealership is to provide the most complete consultancy available; guiding each of our clients safely to their goal of owning and protecting works of fine art for generations to come. The art market is an active one and objects shown today may be gone tomorrow. We cannot assure you that an advertised art object is still in our inventory when you call or even when you see the advertising.